West Virginia is a great place to spend time outdoors. Being almost completely mountainous, it features some of the most stupendous scenery in the U.S. While not quite the perfect place to own an inground pool due to cloudy and rainy conditions, many residents of Charleston, Huntington, and other parts of the state nevertheless choose to add to their outdoor enjoyment by installing their own backyard swimming holes. West Virginia is commonly identified as part of the South, but doesn’t get the long, scorching-hot summers that are associated with the region. Besides the fact that it’s farther north, the elevation in many places also leads to cooler temps. Overall, it’s got a pretty typical swimming season for the United States – roughly May through September. Not to throw water on anyone’s plans, but another important consideration is the amount of rain the state gets. Many parts of West Virginia get 150 or more days of precipitation per year. The state also gets lots of cloudy days, which can make it a tad more difficult to warm a swimming pool to the proper temperature. Fortunately, there are a couple of features that can help you offset some of the drawbacks of the West Virginian climate. If you live in a rainy part of the state, you can get a pool enclosure to make sure the weather doesn’t put a damper on your fun. An electric or gas heater can keep your pool warm without help from the sun (though you’ll have to pay for it in extra in energy costs). If you’re looking for a purely aesthetic addition to your pool, consider some naturalistic landscaping. What better way to decorate a pool in The Mountain State than with a freeform pool shape, lots of plants and stones, and/or a rock waterfall? Construction labor costs are right around the national average in West Virginia, so you can expect the overall cost of a swimming pool to be in the middle as well. Depending on local regulations, you might be able to save money by doing some or all of the work yourself. Installing an inground swimming pool is not for the faint of heart, however. Building permits are issued locally, so contact your city or county clerk to make sure you understand what is required. If you hire a general contractor or pool company to install your pool, they should be able to handle most or all of this paperwork. Still, it’s always a good idea to understand the process so you can be confident that they’re not missing anything. Similarly, pool safety regulations are left to local governments. 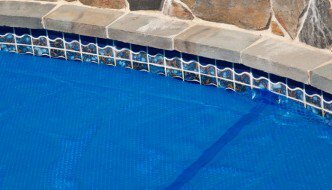 In more heavily populated areas, you may be required to have permanent safety equipment installed, such as a pool fence, safety cover, or alarm. Elsewhere, the requirements may be minimal. Again, whether you’re doing it yourself or handing the project off to a pool contractor, you should be aware of the laws that apply in your area.